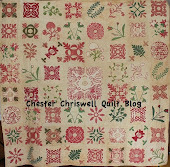 My September block for the Shenandoah Valley Quilt . For some reason the picture loaded upside down. I have finally started stitching the center block of Phebe. I've had the pattern and fabrics for a couple of years but didn't start because of this center block some of the pieces are so tiny. This is one of my favorite patterns. I believe it is because of those little sheep. I want to thank Luann from LooseThreads for sending me the fabric for her dress the center of the vase and the bird wings. They really made a difference. 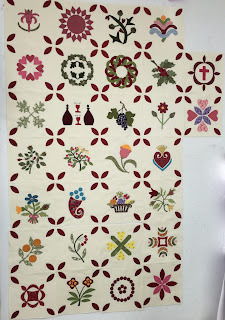 Sentimental Stitches has been sending out patterns each month for the 1857 quilt. Here are my blocks so far. The blocks are to finish 10”. Not sure how I will sew them together with those little melons so close to the seam allowance. 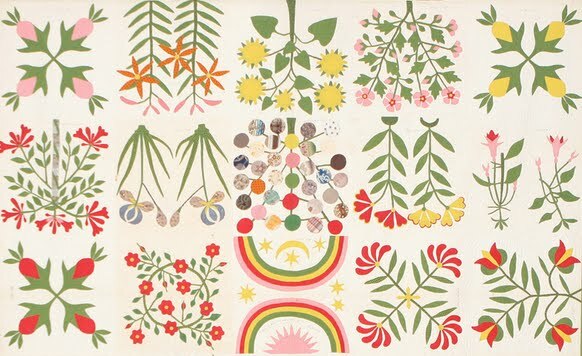 Your Botanical block is beautiful! The start of Phebe is gorgeous, love all those wonderful fabrics. 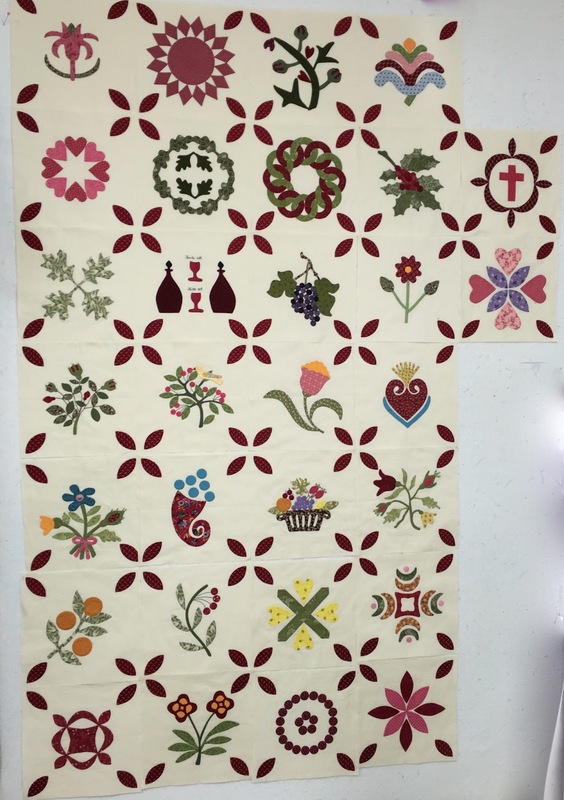 Congratulations, you are making fabulous progress on your 1857 quilt. It is looking quite stunning. 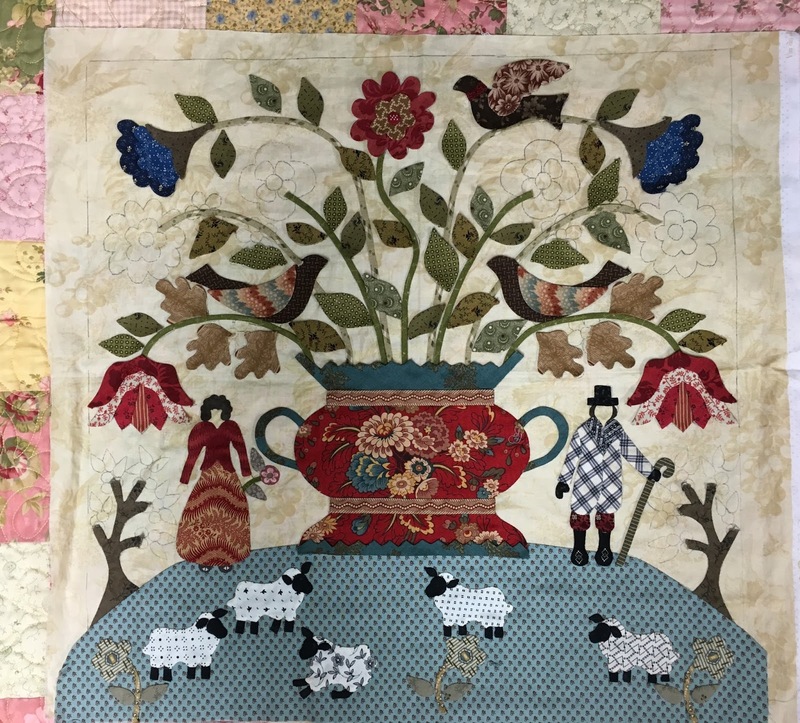 What a lovely impression your careful work and choice of fabric creates in the Shenandoah Valley block! You certainly don't choose the quick and simple patterns, do you? It is all so impressive, Nancy! No one but a fushia lover would know that it was upside down. It is lovely! I love your colors! Your 1857 blocks are really adding up. I have "resisted" the Phoebe challenge, but I surely love seeing yours. It is beautiful! I love your Phebe center. That pattern calls my name every time I pick up Di Ford's book. 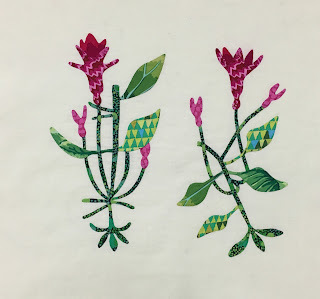 Your applique is lovely!! Nancy all three quilts are beautiful. Luann did send you some perfect fabrics for Phoebe. Your 1857 blocks look so good altogether. All your projects looks great! The phoebe center is just lovey. I lov how you've done your Phebe center--just beautiful! Now I need to find my pattern--I'm inspired! How pretty the botanical block is in the fabrics you selected! I have been so tempted by the Phoebe quilt design so many times. Now I will be watching you work on it and tempting me again. The upside down SV looks great, along with Phoebe and 1857! Lu Ann is a neat Lady! 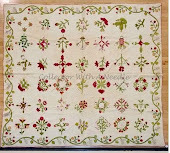 She helped me on fabric for Mountmellick which I am planning on starting again soon. Oh, my gosh, Nancy, the Phebe block is stunning!! I am so excited to see that you have started your Phebe! I love your fabric choices and colors. 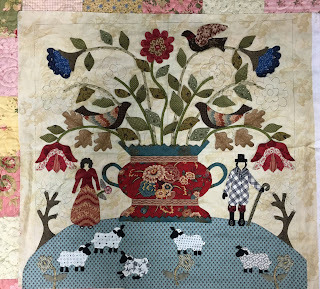 It is just lovely and I really appreciate you showing how you've marked the background fabric for the placement of your appliqué pieces. I am really going to love watching your progress!! ¡¡¡ Febe sera otro gran trabajo!!! Phebe is off to a wonderful start! A quilt filled with such details - watching your progress will be fascinating. Hi sweet Nancy, I miss you!! What are you up to these days? Miss you and your wonderful posts. Hope all is well with you!